My first ever blog award!! 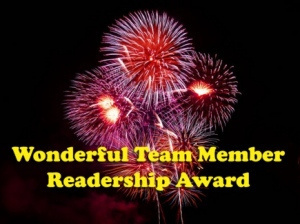 Yes, Gentle Readers, I will confess that I am very excited (and not a little flattered) that Purple Dreamer has recognized me with my very first ever blog award, the Wonderful Team Member Readership Award. First, I would like to say thank you to Purple Dreamer for being so gracious as to bestow upon me this honor as I feel like her contribution here has far outweighed mine on her blog, so now I am doubly in her debt. Secondly, there are requirements for the award, which I fulfill below.